Chennai’s location on the south coast of India means that it is blessed with a great coastline. Chennai’s beaches might not offer the party vibe you’ll see at beaches in Goa and Miami, but they do offer pleasant views and a few great experiences. If you love the outdoors and are looking for a relaxing break, heading to the beaches in Chennai is a good idea. For a great holiday in Tamil Nadu’s capital, visit the best beaches in Chennai. The Marina is Chennai is the best beach in Chennai. From the wee hours of the morning till the evening, you’ll find crowds thronging the beach, either enjoying fun activities or enjoying the sea breeze. You’ll also find groups of kids and families playing cricket and throwball at the beach. Swimming is strictly prohibited here. The lighthouse at the southern end of the beach is a must visit, it is India’s only lighthouse with a lift. Go to the top and check out excellent panoramic views of the beach and the city. 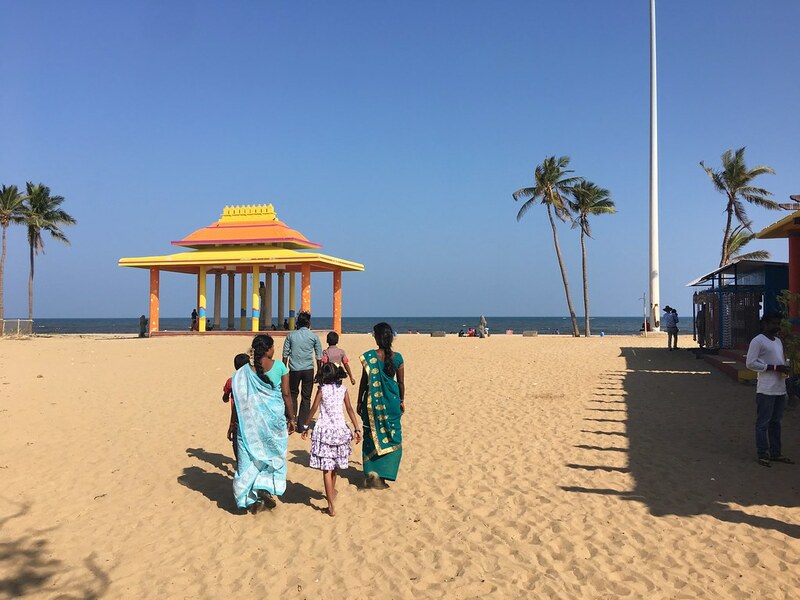 Not as crowded as the Marina beach, yet the Besant Nagar Beach sees its fair share of tourists, especially on the weekends. The beach is popular for its arch, that has been captured in numerous Malayalam and Tamil films. While you are at the beach, do not forget to try the famous Murugan idlis, they are amazingly delicious. During peak times and in rush hour, you might have to wait a bit to get your dose of hot idlis. One of the good beaches in Chennai, this is less crowded than the other two beaches mentioned above. Breezy Beach is great for those who love to spend time at quieter places. Even though this beach is located close to a residential area, it is normally empty. Although on weekends, it does get a bit crowded. If you are looking to grab a quick bite, there is a small café located near the beach. The beach is great for long evening walks and you can enjoy horse rides at this beach. The Kovalam Beach is as popular as Marina Beach. Situated a fair bit away from the main town, this beach is ideal for those looking to enjoy a day out in the sun. During the peak tourist season, this beach is a haven for adventure and water sports. Parasailing, paragliding, scuba diving and jet ski rides can all be enjoyed here. Those looking to soak in the sea breeze or get a tan can hire a beach bed on the seashore. This is a private beach, so you will have to pay an entry fee to get in. Located inside the VGP amusement park, this beach is filled with potential for fun and excitement. From making sand castles to enjoy a few beach rides, kids will love the many fun games they can play at this beach. Adults can just relax at the beach chairs on the seashore. Situated near the cathedral, the Santhome beach is ideal for evening walks or chilling out in the sun. In the evenings, the place sees many street food vendors lining up on the seashore dishing out delicious goodies. A must try at the Santhome Beach is Subndal. It is made from dry peas garnished with shreds of coconut and mango. Thiruvanmiyur Beach is great for morning walks. At the beach, you can catch a glimpse of the sunrise; it is a magical experience. There are a few small shops and food stalls that dish out delicious local breakfast goodies. Most of the time, the beach is pretty empty, so, it is a great place to chill out and just lounge about. The best time to visit is in the evening, the weather is cooler and you get to enjoy the sea breeze. Unlike the other beaches in Chennai, the Palavakkam beach is much more spacious and it is less crowded. The best time to visit the beach is during sunrise and sunset. Watching the sunrise and sunset is an amazing experience at the Palavakkam Beach. For those looking to spend a few days at the beach, there are hotels and resorts around. If you plan on driving down to the beach, there is a large parking lot that is safe for parking. A favourite for the local Chennai crowd, Kasimedu Beach serves as the perfect getaway. Offering stunning and panoramic views, this place is great for a day out, away from the noise and crowds of the city. The highlight of the beach is the pier. Kasimedu Beach is one of the few places where you drive down straight to the sea. During the weekend and in the evenings, you can find locals playing volleyball, football, cricket and other outdoor sports. The Kasimedu Beach is also a popular place for film shoots. Small in size, the Neelankarai beach is less crowded when compared to other beaches in Chennai. Clean and tidy, the beach is ideal for those who love romantic walks along the seashore. There are a few food stalls near the beach that serve delicious local delicacies. The best part about Chennai’s beaches is that they are all clean and offer many activities. So, the next time you are looking for some fun, enjoy the fresh sea breeze, play sports at the seashore or just walk on the sand with your beloved. Do you love spending hours at the beach? If the answer is yes, we would love to hear your favourite things to do on a beach. Share your thoughts in the comments section below.